Whys this Dutch DAF a little different from the rest?? It looks fairly normal on first glance but look a little closer. Spotted by Matt Campbell down in Italy yesterday. The DAF bongs to Dutch company Theo Faassen BV. 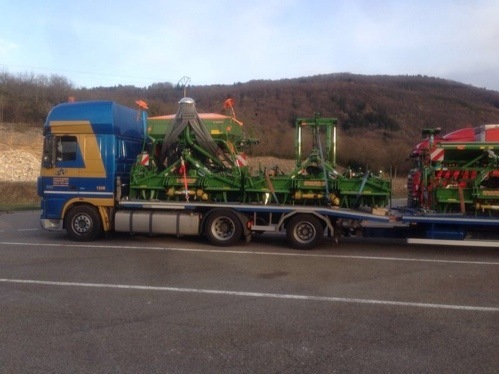 Loaded with agricultural machinery from Holland. If you think you can see what I’m seeing then leave your comments below. 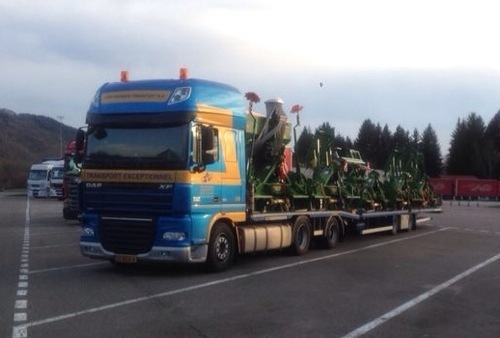 Looks like Theo Faassen have come up with a very versatile truck! This entry was posted in DAF, Drivers Photos by truckbloguk. Bookmark the permalink. 4×2 DAF turned into a double articulated wagon & Drag via 5th wheel, dolly with tow eye for the trailer coupling. Send the £1,000 prize to….